Shutterstock/Grekov’sAn Australian bride just asked the unthinkable. 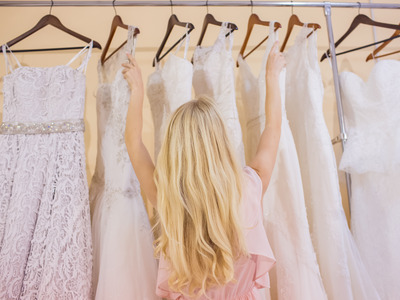 Everyone’s heard a horrific bridezilla story, but this one might take the three-tiered cake: A bride in Australia outright asked her bridesmaids to help purchase a dress that cost double her budget, Good Housekeeping reports. This bride was a little overzealous in her planning: She pestered this particular bridesmaid about tiny details like wedding makeup and the groom’s buttonholes. She even asked the bridesmaid to craft an Excel sheet of potential cake makers during the middle of a workday. And then they went dress shopping. Caroline found a dress that she loved but was well above her budget at $10,500. She bought it anyway, then sent her bridesmaids a group email, saying that “she would really love if we could ‘pitch in’ around $150 each towards her ‘dream dress,'” the anonymous bridesmaid wrote.